2013 Senator Legarda Allots 1000 Philippine Indigenous Woods to FEED | FEED, Inc.
January 17, 2013, Makati, Philippines. 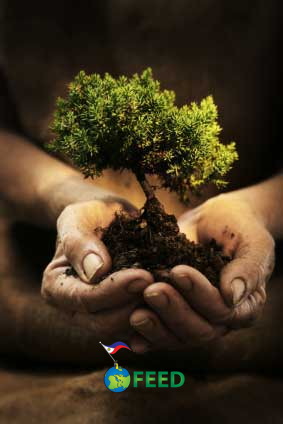 The Philippine Department of Environment and Natural Resources, have endorsed 1000 Philippine indigenous Narra wood seedlings to FEED to boost the “LIVING LEGACY: Plant a Tree, FEED Our Future” program launched in collaboration with the University of the Philippines, Los Baños (UPLB) and the Armed Forces of the Philippines (AFP) – through a Triparty Memorandum of Understanding, aiming to reforest and restore sustainable livelihoods and agricultural and forestry productivity on 8,800 hectares in the Laguna-Quezon Land Grant Development Project site. Dr. Neria Andin, DENR-NCR Regional Director came to know about FEED Inc thanks to the gracious inquiries, intervention and support of Senator Loren Legarda and Legislative Officer Mars Flores, who offered FEED to speak to the DENR in lieu of said NGP, which covers tree-planting activities on about 1.5 million hectares by 2016. Since the NGP was launched in 2011, the DENR has planted seedlings on more than 232,000 hectares all over the country, helping to restore the livelihoods of communities all over the Philippines. Because of the perfect score garnered by the Philippine administration’s twin forest policies, the Philippines also improved by eight notches to No. 42 among 132 countries on the international Environmental Performance Index (EPI), an evaluation of the sustainability of nations’ environmental programs and policies by Yale University, Columbia University, the World Economic Forum and the Joint Research Center of the European Commission. The Philippines outranked countries like South Korea (43rd), Australia (48th), United States (49th), Singapore (52nd) and Israel (61st). Senator Loren Legarda of the Philippine Senate is also known to advocate “quality human living harmonious with nature by seeking the path for green growth and sustainable development…”. As a public servant and journalist, she also devotes her work to ensuring that “future generations of Filipinos will live in enabling environments where our natural resources are used in ways that are sustainable and equitable; where social justice, human rights, peace and cultural diversity are priorities; and where opportunities for quality education and decent employment to all hard-working citizens free them from poverty”. FEED thanks all supporting parties and individuals involved who by the grade of their voluntary efforts are making the restoration of sustainable farming, agriculture and livelihood development possible. Photos: Courtesy UPLB Land Grant Management Office.